During the November 15 MAIS playoffs, Jackson Academy honored Dr. Gene Barrett at halftime for his 30 years of generous service to JA student athletes. As an orthopedic surgeon and JA’s first and only team doctor, Dr. Barrett has traveled to both home and away games providing devoted care for Jackson Academy’s student athletes. 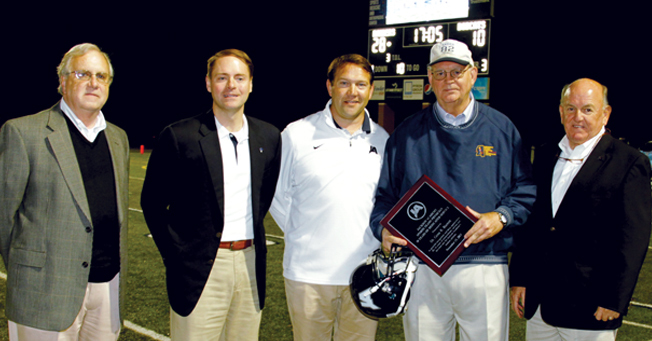 Jackson Academy President-elect Cliff Kling, Headmaster Pat Taylor, Athletic Director Bobby West, and Booster Club President John Stratton presented a commemorative plaque, a jacket, and a signed helmet to Dr. Barrett. Dr. Barrett’s family members have been involved and well loved in the JA community, including his wife, Linda, and their sons David and Austin. Austin, who played football and baseball, graduated in 1999. He is now a hip and knee specialist with Mississippi Sports Medicine and Orthopedic Center. He and his wife, Allison, live in Jackson. David, who played football and was North AAA All Conference 1st Team and was recognized for ESPN’s “Play of the Year,” graduated in 2005. He is an account executive with Comcast/Fox 40 in Jackson. Not only has Dr. Barrett supported the Raiders on the field and court, he has provided guidance in school governance as a member of the Board of Trustees. His personal philanthropic support of Jackson Academy has been generous and effective in bringing about much-needed facilities improvements on campus.